Are you planning to run a social media contest for your business? Do you need a guide to ensure that you do not miss out on crucial details while running a contest? Don’t worry! We have the answers for you. Running an online contest can be a very effective medium for a brand. The benefits are obvious give away a small prize in exchange for a potentially massive crowd to interact with your brand and they even provide you information which could be used effectively by your brand in the future marketing strategy. 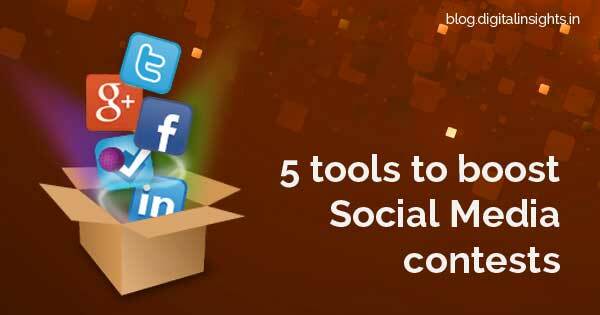 We have listed down 5 tools which will help your business to conduct contest easily on social media. My Favorite! Rafflecopter is a contest management tool that lets you embed an entry form that you customize on your web site. It gives your audience incentive to perform certain tasks to get entry into a contest. You can put it anywhere that you can put HTML code. You can collect entries within minutes of customizing it to your liking. Entrants get multiple opportunities to get contest entries and increase their chances of winning. It’s a great Giveaway tool! It has 3 plans – Free, Blogger subscription ($7.99/Month) and Business subscription ($59.99/ Month). Strutta will help you run the perfect contest or sweepstake. You can choose between a user generated photo/video contest or sweepstakes. Strutta offers lots of customization options that will help build a brands campaign which is true to their image. Its coolest feature Do-It-Yourself Contest Builder is designed for non-technical marketers. The platform allows for a user experience branded through simple setting adjustments and customizable through CSS styling. It offers 3 plans as per each business needs – Core, Pro and Custom. This is a great tool that helps you run competitions on all major social networks – Facebook, Twitter & Vine, YouTube, Instagram, Pinterest and even your brands website. Through this tool you can increase fan engagement and generate buzz with social media promotions: Photo contests, Video contests, Sweepstakes, Mobile and Web Promotions. Votigo offers 3 plans to its users – Social Marketing suite, Premium Promotions and Standard DIY Promotions. This tool makes it very easy to run a competition and if you are a start up company who is trying their hand with contest. This is the perfect tool for you as it lets you use it till free until you reach 25 contest entries or users. With this tool you can create your own online photo, writing competition- Either on your brand website, Facebook fan page or your mobile app. This tool has 2 plans a basic and full plan which can be chosen by businesses as per their needs. PromoSimple lets you design your own giveaway with lots of customization options, integrate it on your blog and track all your entries till the giveaway is over and also allows you to choose your winners. Aside from the usual details for entering a contest, PromoSimple can also require users to provide personal information, which you can use to analyse your demographics. It provides lots of plans for users – Free, Bronze, Silver, Gold and Platinum. Social media contests engage consumers with your brand in a personal and meaningful way, while delivering valuable information, preferences and feedback you can put into play to enhance your business offering. Have you run a social media contest by using by any 3rd party tools? Do tell us about your experience in our comments section below. Thanks @Adspringr:disqus for the addition, let me have a look at the tool. Thanks again. Thanks for including Votigo! – Jim Risner, @jimrisner Co-founder, Votigo.